Israeli Prime Minister Binyamin Netanyahu told the media that his military forces would respond ‘with a firm hand’ to an attack by two Palestinians on a yeshiva (Jewish religious institution for study) in Jerusalem in which four religious Jews were killed. Another Israeli government official compared the attack to the Holocaust. 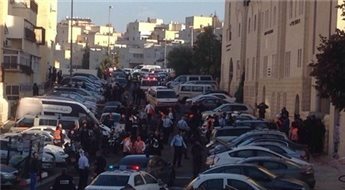 The two men who carried out the attack were identified as Ghassan Abu Jamal and his cousin Odai from Jabal al-Mukabbir neighborhood of Jerusalem. After Tuesday’s shooting attack, Israeli Prime Minister blamed both Hamas and Mahmoud Abbas, the Palestinian President – whose Fateh party recently reached a unity agreement with Hamas. The two men involved in the attack did not claim affiliation with any Palestinian faction, but an alleged representative of Hamas praised the attack in Israeli media.